First, I’d like to tell you a story before my burger. We moved to Bainbridge Island about 6 months ago. 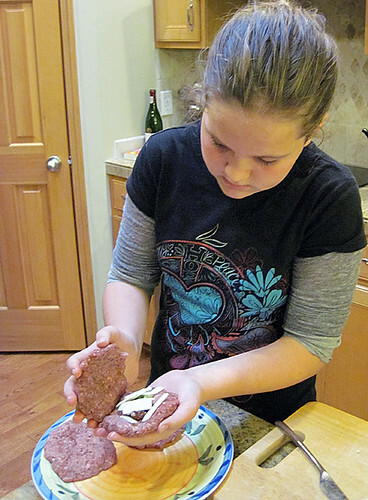 I am almost done with 6th grade and love cooking and animals. My mom signed me up for horseback riding lessons after we moved here. I go to Harmony Farms (Horse Harbor Foundation). It’s a non-profit organization and I am working on a school project about it right now. 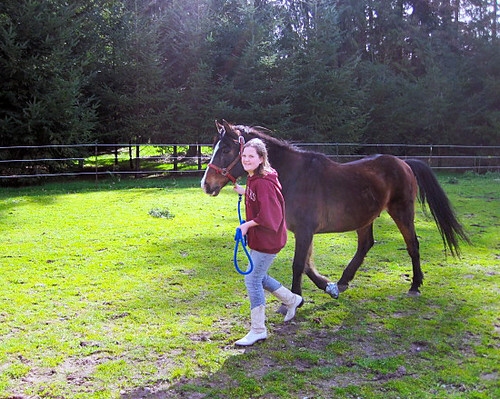 They give abused and neglected horses a loving forever home. I LOVE IT!! I ride every Monday and just signed up to volunteer on Thursdays. I will be cleaning stalls and helping groom horses and give them lots of love. I love all of the horses but I do have my favorite his name is Johnnie. Here is his story that is on the Foundation’s web site. Johnnie is a 23-year-old Polish Arab with a tragic past. He is one of the most severely abused horses the Foundation has ever dealt with. His previous owner beat him almost to death, and when we got him, he was vicious, unfriendly, and severely headshy. It took four years before he realized he wasn’t going to be hurt again. Once he got past that, he became a school horse, and, because of his energy and agility, was used as a beginning jumping horse for a time. Having passed his prime, he is now rarely used for jumping, though he’s still an excellent riding horse and useable at all experience levels. He has mellowed out quite a bit but is still easily frightened. Had he not been abused early in his life, he would have been a fine show horse due to his handsome and flashy looks and athletic ability. Johnnie was also recently diagnosed with Cushings, a disease similar to diabetes , and is being treated for it accordingly. I hope someday to be able to help horses like this foundation has. On to the burger part of this post! Are you always having your burger topings fall out the back end of your bun! I do, so I decided to make a burger with the toppings inside. I LOVE bacon and provolone cheese so this is what I used to make this delicous burger. Mix this all together in a big bowl. I use my hands to squish it all together. Make 8 1/4lb burgers flatten and put in fridge. Take one burger and hold in your hand, place bacon mixture and cheese in the middle. 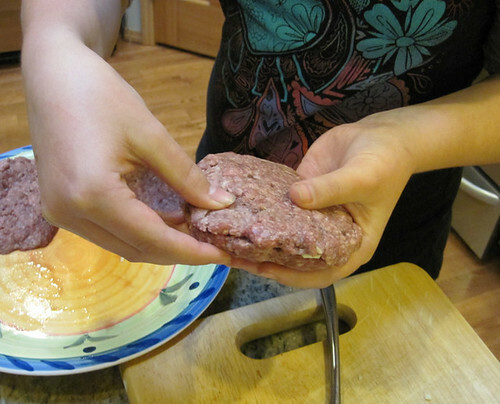 Take another buger and place on top and seal edges. Seal the edges up good. You don't want the cheese oozing out! Place on grill and cook for approx 4 min per side. 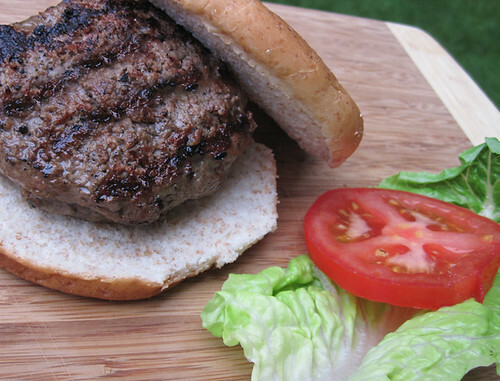 Take a toothpick and poke burger to release steam. Place burger on bun and add any other toppings that you enjoy. I added tomatoes and lettuce. This looks terrific, Emma! Great idea to put the trimmings inside. I love your story about Johnnie and the horse sanctuary. What a great place! Beautiful posting Emma. Hooray for the wonderful work you are doing and for your kindness. And that burger – looks mighty special! Hi Emma, I love your inside out burger idea! I always loose the toppings too. A childhood friend of mine loved horses too. She worked in the stables and spent most of her youth tending to them. Your passion for helping horses will someday flourish into something big and exciting, stay with it! My dad brews beer so there is usually some in the outside fridge. It adds nice flavor and my dad tells me that the alcohol burns off. It was delicious…..we will definitely be making them more often and experimenting with some of Emma’s other favorite cheeses. Nice job, Emma – with the burger and the horses. You know, your uncle Mick also loves cooking animals. Hi Emma! That is such a great idea and I loved your story about the horses. It sounds like you are having a great time in your new home. What a great idea, Emma! It looks delicious. Did you know your Uncle JP had a horse named Johnny Cash? Great story about the sanctuary. It’s great to see you’re enjoying it so much. I linked Jp’s post that has a picture of him on Johnny Cash. great post! i love the idea of putting the toppings inside. this looks great! Emma, what a wonderful idea. And thank you for sharing your story:) The burger looks amazing! This sounds amazing! I’m all about gooey cheese in the middle!